Three years. That's how long it's been since Nokia has offered a phone for the largest carrier in the US: a unique (and yet wholly forgettable) device known as the Twist. Needless to say, the arrival of the Lumia 822 at Verizon Wireless comes at a crucial time for Nokia, which must quickly establish itself in the United States if it hopes to remain a legitimate contender in the smartphone realm. That's a lot of weight to carry on one's shoulders -- even for a mighty Finn. Fortunately, the Lumia 822 is well-suited to help establish a beachhead on Lady Liberty's shores. At just $100 on-contract, it's a good value and deserves genuine consideration from OS switchers and first-time smartphone buyers alike. Granted, it lacks the premium display and camera wizardry of the Lumia 920, but with greater built-in storage and a better front-facing camera, it narrowly bests the Lumia 820 for AT&T and the Lumia 810 for T-Mobile. Add to that Data Sense -- a new data monitoring and compression feature of Windows Phone 8, but currently exclusive to Verizon -- and the Lumia 822 easily becomes the most compelling of Nokia's mid-range Windows Phone lineup. Even if its design is a bit... bland. How would you rate the Lumia 822? Have you ever lied and told somebody they looked good only to spare their feelings? That rationale may be fine for humans, but it's completely unnecessary with smartphones. Unlike the elegant Lumia 810 or the quirky Lumia 820, the design of the Lumia 822 lacks any semblance of style. For starters, in a change from its siblings, the phone's face isn't a clean sheet of glass, but rather features a plastic lip at the bottom that prominently displays the Verizon logo. What's more, the Lumia 822 is available only in black, white and gray, and it also lacks the unique removable shell that's characteristic of the Lumia 810 and 820. Instead, you'll find a run-of-the-mill plasticky rear cover that contains Carl Zeiss branding on the camera pod and a 4G LTE logo at the bottom. Put simply, if the Lumia 822 turns any heads, it's probably for all the wrong reasons. The Lumia 822 is also quite thick, and we'd be tempted to suggest that it lose some weight -- if only it didn't feel so damn good in-hand. Each of the phone's controls are laid out on the right-hand side, which includes the volume rocker, power button and dual-stage camera button. While the Lumia 822 may not be much to look at, its design is partially redeemed by the excellent placement of the controls and ports. Whether you're left- or right-handed, you should have no issue cranking up the volume or waking the device, and even the camera button is well-positioned for landscape use. 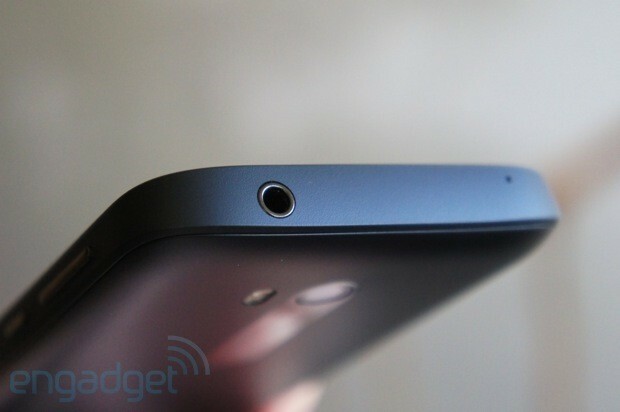 Up top, you'll find a 3.5mm stereo headphone jack and a secondary microphone. Along the bottom, a micro-USB port is situated between the loudspeaker and primary mic. If you pay close attention, you'll also discover ambient light and proximity sensors to the left of the front-facing camera. One thing you won't find, however, is a notification light, which is included in the more expensive HTC 8X. Fortunately, if you're willing to look beyond the Lumia 822's ho-hum design, you'll find that its true beauty lies within. 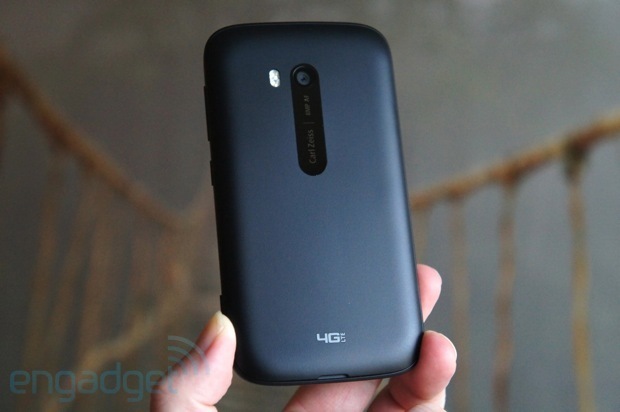 The phone includes a Qualcomm Snapdragon S4, which brings a speedy and efficient dual-core 1.5GHz CPU and an Adreno 225 GPU. Along with support for Verizon's domestic EV-DO and LTE networks, travelers will appreciate that the device is unlocked for global use. Here, you'll find quad-band support for GSM and WCDMA networks. The Lumia 822 also offers 802.11a/b/g/n (WiFi), Bluetooth 3.0, GPS, GLONASS and NFC. 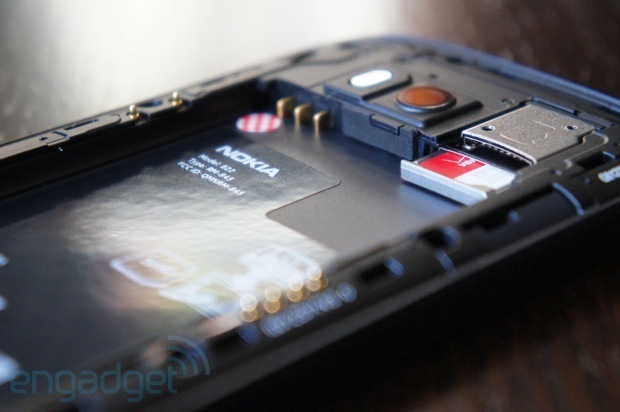 If you're considering both the Lumia 822 and HTC 8X, a couple factors that may tip the scale in Nokia's favor include a removable 1,800mAh battery and a microSD expansion slot -- two features that are completely absent from the high-end HTC 8X. 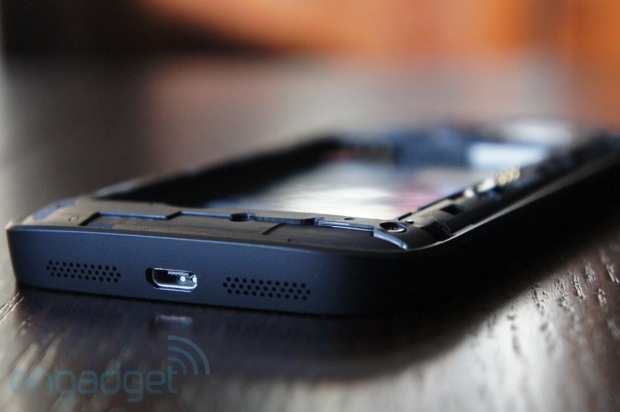 Those willing to snag an optional backplate and Qi base station will also be able to wirelessly recharge the handset. The Lumia 822 features a 4.3-inch ClearBlack AMOLED display, and although its 800 x 480 (WVGA) resolution can't match the pixel density of the 720p HTC 8X or the qHD Droid RAZR M, Nokia's mid-range contender offers plenty of real estate for content, vibrant colors, deep blacks and superb viewing angles. Like Nokia's other Windows Phone 8 devices, the touchscreen is more sensitive than its competitors, which means that you'll have little trouble controlling the device with your fingernails or while wearing gloves. As another unique advantage, Nokia's ClearBlack technology incorporates a polarized filter that substantially improves the screen's readability in direct sunlight. We're also happy to report that the Lumia 822 offers a true RGB matrix display that renders text more crisply than WVGA counterparts that sport the PenTile (RGBG) matrix. For a more detailed breakdown of the hardware within the Lumia 822, we've included a complete spec sheet for your perusal. Despite the Lumia 822's positioning as a mid-range handset, it performs similarly to high-end selections such as the Nokia Lumia 920 and HTC 8X. Because all phones in the Windows Phone 8 roster currently include the Snapdragon S4 from Qualcomm, you're not going to find much differentiation on this front. On the plus side, you won't need to spend more to find a faster device. Our interactions with the phone were generally zippy -- things like browsing the web, playing media and navigating menus all felt smooth. The Lumia 822 is also consistently quick to find its GPS positioning, which is helpful considering Nokia's emphasis on location-based apps. That said, there are still a few areas across the Lumia lineup that could use some improvement. One example is Nokia's home-brewed apps, which take a bit longer to load than core OS components such as the messaging and dialer apps. The camera is also a bit pokey -- it takes a couple seconds to properly focus and meter a scene. While it's not a huge issue, the Lumia 822 takes somewhere in the 40-second range to cold boot, which is about twice the time we've come to expect from modern smartphones. 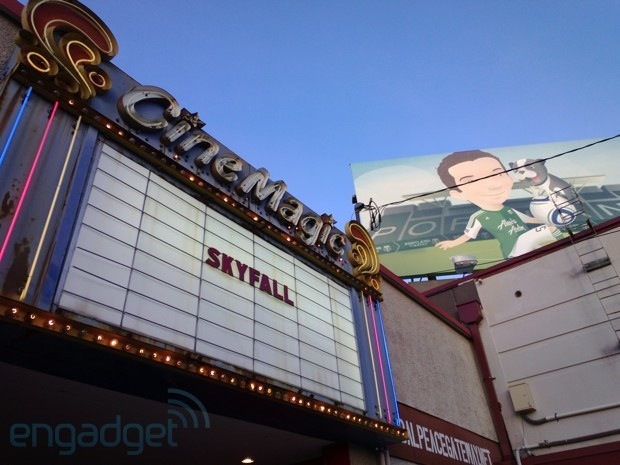 Call quality on the Lumia 822 is serviceable, but it's not exactly a high point either. Even during calls to landlines, we consistently perceived other's voices as tinny, and our friends often remarked that we sounded distant and muted. While you'll have no trouble carrying on a conversation with the Lumia 822, if voice quality is particularly important to you, we recommend that you consider the Lumia 810 from T-Mobile. The Lumia 822 provides battery life that's generally on par with what we've seen from other devices in the Windows Phone 8 lineup. In this sense, you should have no trouble using the handset for a day or even two with moderate to light usage. It's also worth pointing out that you can further extend battery life by disabling SkyDrive sync, and if you're ever truly in a pinch, Windows Phone 8 includes a battery-saving mode that disables background data tasks. 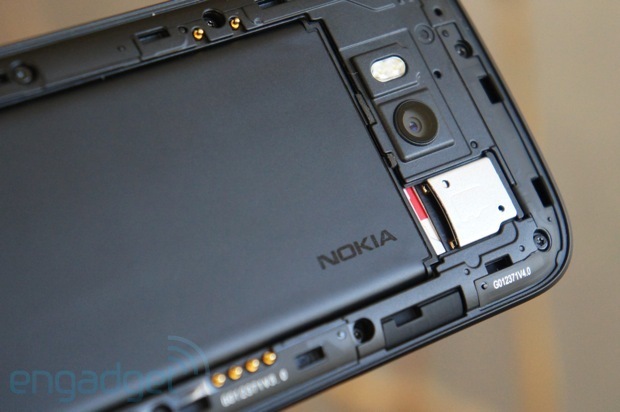 Also in line with its peers, the Lumia 822 chugged along for 2.5 hours in the WPBench battery torture test. 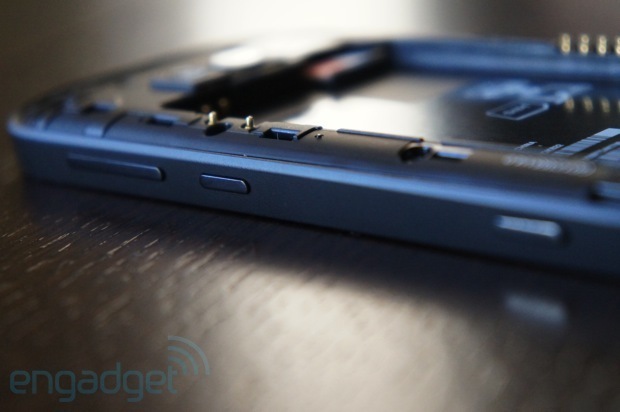 When it's time to juice up, you'll be able to recharge the device in just under two hours. 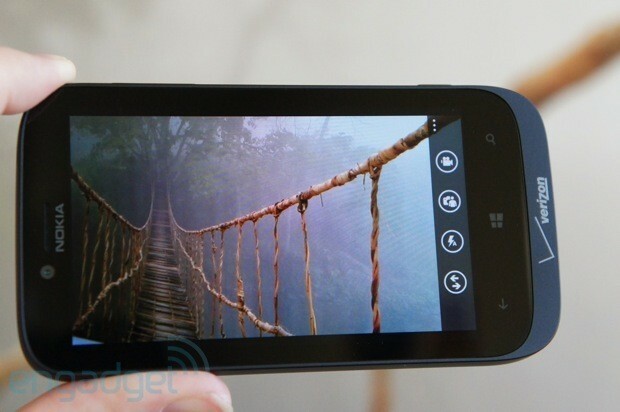 The Lumia 810 combines an 8-megapixel sensor with a Carl Zeiss 26mm f/2.2 lens, which is accompanied by a dual-LED flash and a two-stage shutter button. By default, the camera is set to capture images at 16:9, though we generally prefer the optional 4:3 aspect ratio, which makes full use of the camera's sensor. Unfortunately, the setup isn't the speediest you'll encounter, which is largely thanks to some pokey AF implementation. Still, your patience will be rewarded with beautiful shots that provide an excellent amount of detail. In all but the rarest cases, the Lumia 822 properly meters light and delivers accurate white balance. Its low-light performance is another strong suit, even though the software lacks a true HDR mode. Within the simplistic camera app, you'll find the ability to adjust ISO, EV and white balance, along with a few scene modes such as close-up, night, sports and backlight. While the selections are a bit limited, our major complaint is with the software interface, which makes it difficult to preview your adjustments. Beyond the core camera software, you can extend your photographic options with specialized apps known as Lenses. Upon first glance, the only Lens on the Lumia 822 is Bing Vision, which allows you to capture QR codes and Microsoft Tags, and search for books, movies and albums by scanning the barcode or cover. Fortunately, it's quite easy to install other Lenses from this interface, including Nokia's own additions such as Creative Studio, Panorama, Cinemagraph and Smart Shoot. The Lumia 822 is capable of recording video in 1080p (30 fps / 20.9 Mbps), and if you're able to hold the phone still enough, you'll find that it's a competent performer. Keep in mind, however, that the phone lacks the optical stabilization technologies of the Lumia 920, and because of this, you risk capturing scenes that are full of distracting jitters. On the whole, the Lumia 822 records at a smooth frame rate with a great amount of detail and excellent audio quality. The handset is also capable of dynamically adjusting its focus as you record. Curiously, our test videos were free of the overly aggressive white balance shifts that plagued the Lumia 920 and 810, although your mileage may vary with this one. 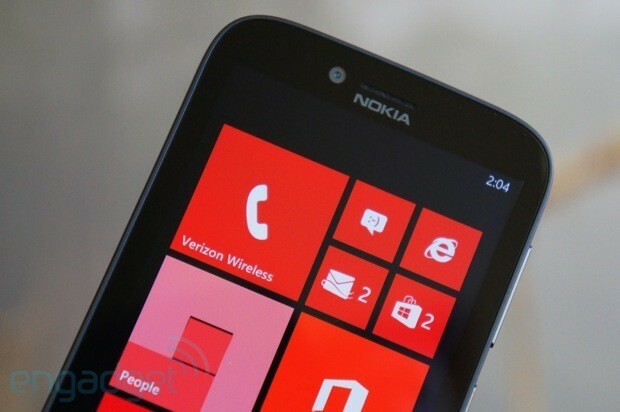 The Nokia Lumia 822 is among the first smartphones on the market to ship with Microsoft's latest mobile OS, Windows Phone 8. Whether you're already familiar with Windows Phone or have yet to give it a spin, the software is friendly and intuitive, and the setup process is dead simple. Upon first booting it, you'll be prompted to choose your preferred language, and then you'll be asked to choose between a recommended configuration scheme or an advanced dialog that allows you to customize the default options. This includes enabling mobile data usage and automatic updates, along with reporting your usage habits and nearby WiFi hotspots to Microsoft. Because location services are central to Windows Phone 8, the phone will ask to report your location to Microsoft upon activation. This is a one-time deal, however, and you can also opt-out of sending your location. First-time users are next given the option of setting up or signing into a Microsoft account, which is necessary for purchasing apps and syncing content. If you've reset the phone to its factory state, you'll also find the ability to restore your settings and content from the cloud. In this sense, it'd no doubt be helpful if users were first able to configure a WiFi connection in order to minimize mobile data use, but you can also skip the sign-in process if this is a concern. Following the Microsoft account setup, you're then given the option of configuring Verizon Wireless Backup and Sync Services, but it's only of much value if you're looking to restore contacts or email accounts from Backup Assistant Plus. Even though Verizon's service is free, the utility is otherwise redundant because Windows Phone 8 is capable of syncing contacts, email and calendars with Microsoft Live, Outlook.com, Google and Yahoo. It also offers SkyDrive integration, which allows you to store documents, text messages, bookmarks, photos, apps and their settings to the cloud. Likewise, Windows Phone 8 also brings integration with Facebook, Twitter and LinkedIn, along with contacts and photos associated from those accounts. As it stands, the Windows Phone Store currently houses upwards of 125,000 apps, although many popular cross-platform selections remain absent from the list. This includes Flipboard, Google Voice, Instagram, MOG, Pandora, Pinterest, Pocket, Sonos, Spotify, Stitcher, TiVo and TuneIn, to name a few. Naturally, there are third-party apps that fill the void for some of these selections, but you'll need to consider this before diving into the Windows Phone ecosystem. Early adopters will find comfort in knowing that Windows Phone 8 shares its code with Windows 8, which means that developers have a strong incentive to provide apps for both platforms. Nonetheless, you're likely to experience growing pains as Microsoft's platform establishes roots. If you're not yet familiar with Windows Phone 8, we encourage you to check out our full review, which covers all the new functionality of Microsoft's latest OS. Despite its smaller app ecosystem, Nokia has developed a number of apps that make Windows Phone 8 -- and Nokia handsets, in particular -- a very compelling choice. First and foremost is Nokia Drive, which provides voice-assisted, turn-by-turn directions, even without a mobile data connection. By allowing users to selectively download maps from all 50 states and throughout the world, Nokia Drive delivers offline functionality that's substantially better than Google Maps and completely absent within Maps for iOS 6. 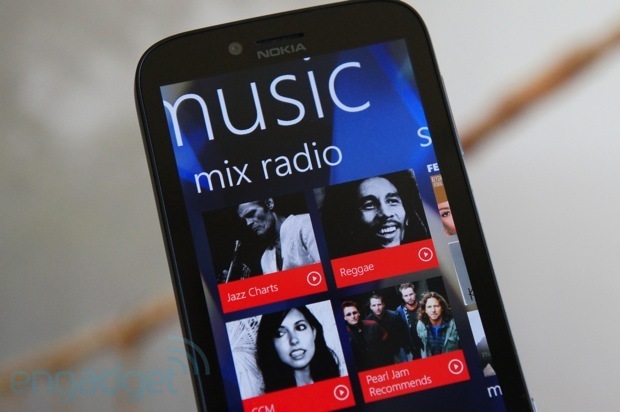 Another app that Lumia owners are bound to appreciate is Nokia Music, which offers a free service known as Mix Radio. In addition to curated selections of genres and chart toppers, you'll also find the ability to create your own mixes based on your favorite artists. Better yet, you can download any track that's currently playing for offline listening, all at no cost to you. Combine this with the fact that Mix Radio is completely ad-free, and you might just consider grabbing the Lumia 822 for this feature alone. As a couple added bonuses, the app also provides local concert listings and its own music store. Also on deck from Nokia is City Lens, which allows you to discover nearby places of interest such as hotels, landmarks, restaurants and shopping centers. The app is similar to Microsoft's own Local Scout, but with an augmented reality component. Unlike Local Scout, however, which combines relevant tidbits like addresses, phone numbers and user reviews, City Lens lacks this integration. 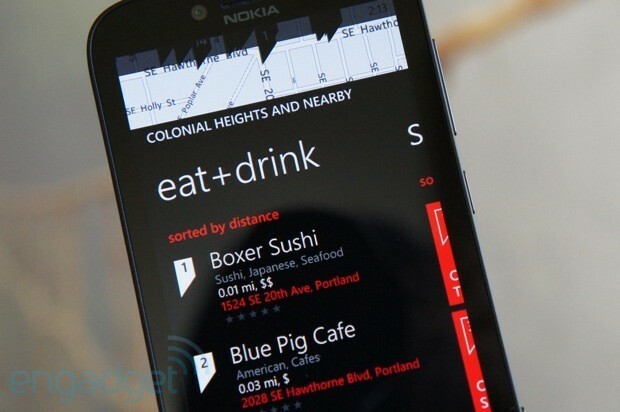 Instead, you'll need to jump over to Nokia Maps to access this information, which detracts from the app's usefulness. Nokia has a number of other app exclusives for Lumia owners, but you'll need to download these selections from the Nokia Collection within the Windows Phone Store. This includes camera apps such as Creative Studio, Smart Shoot, Panorama and Cinemagraph, along with Nokia Transit, which is useful for planning public transit trips. Oddly enough, this fantastic app was completely absent from the Nokia Collection, and we were only able to install Nokia Transit after manually searching for it. 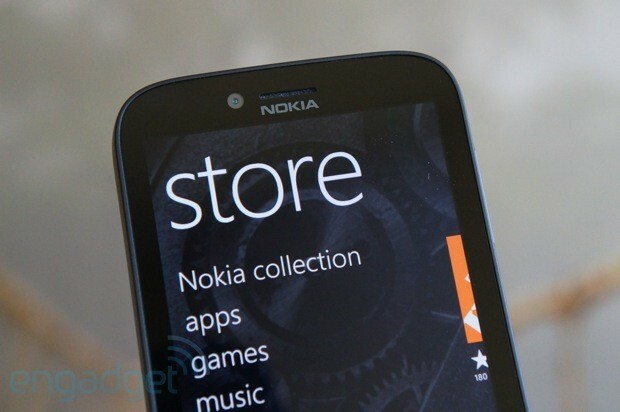 As another frustration, the Windows Phone Store failed to report updates that were available for many of Nokia's apps. Instead, we were forced to dig within the Nokia Collection and individually select Nokia Drive, Maps, Music and City Lens to discover that updates were available. Nokia also has a few partner apps that come bundled on the Lumia 822. Here, you'll find ESPN, Univision and The Weather Channel. As with all apps that aren't part of the Windows Phone core system, you can completely uninstall any titles that you don't want. As you might expect, Verizon has also bundled a couple of apps onto the Lumia 822, but this is limited to My Verizon Mobile and NFL Mobile. My Verizon Mobile takes an eternity to load and its interface is awful -- it looks like an early Android app -- but it's helpful if you ever need to check your usage, view / pay your bill or access customer support. Meanwhile, NFL Mobile is a much nicer app that brings exclusive content from the NFL Network, but it appears that Verizon will begin charging users a $5 premium to use it starting in mid-December. 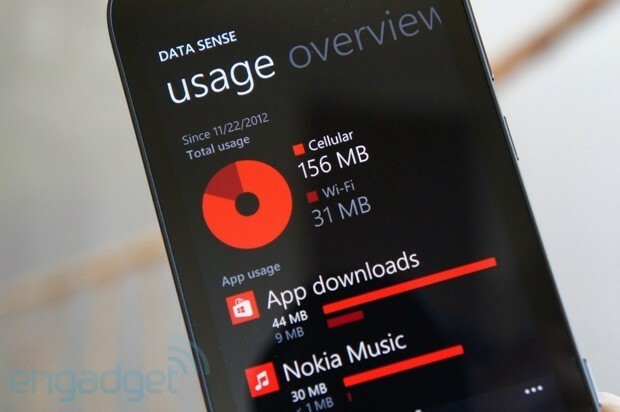 New to Windows Phone 8 is a feature known as Data Sense, which is designed to help you conserve and keep tabs on your monthly data usage. For the moment, this feature is exclusive to Verizon Wireless, simply because it requires integration with carrier networks. At its most basic level, you'll find the ability to monitor your monthly data usage within a Live Tile, and if you're ever feeling analytical, you can open the Data Sense app to find a detailed breakdown of each application's data consumption. Within the settings, you'll also find the ability to input your billing cycle and plan details, along with an option that automatically suspends background data if you approach your monthly limit. Beyond simple monitoring, Data Sense also provides a multi-pronged approach to help you squeeze more out of your data plan. For example, depending on your monthly data cap, the software will selectively queue certain tasks to run when you're on a WiFi network. From within the Data Sense app, you'll also find a map of WiFi hotspots in your area, which is crowd-sourced from other Windows Phone 8 users. Unfortunately, it'll take a bit of time for this feature to become useful; as is, we were only able to find the location of nearby Starbucks stores. There's one other component of Data Sense that goes entirely unmentioned in the app, and that's the server-side data compression that happens every time you visit a page within Internet Explorer. The feature is undoubtedly useful, and it's similar to what you'll find with BlackBerry and the Kindle Fire, along with apps like Opera and Onavo Extend. That said, it's also unsettling that Microsoft makes no attempt to inform users of this feature. In fact, the only indication you'll ever see of this compression service is within the advanced settings of Internet Explorer. Perhaps Microsoft was concerned that users might disable a worthwhile feature out of sheer paranoia, but we'd still like to see the company be a bit more forthright with its handling of your data. In all, it's difficult to gauge how much data you'll actually conserve with Data Sense, but it's a worthwhile facet of Windows Phone 8 that's currently a key selling point for Verizon Wireless. Even though the app is easy to configure, we're left with the feeling that Microsoft should take the carrier integration a step further by having Data Sense automatically configure itself with your data plan. It's one of those "why not?" features that'll hopefully come with time. The Nokia Lumia 822 isn't likely to inspire love at first sight, but if you're able to look past its homely design and chunky enclosure you'll quickly discover a device that's worthy of your affection. The Lumia 822 is a well-rounded handset offering good performance, solid battery life and an excellent camera. It also narrowly edges out Nokia's other mid-tier smartphones with a higher-res front-facing webcam, twice the internal storage and Data Sense. Unfortunately, the Lumia 822 doesn't fare as well against the similarly priced Lumia 920, which is currently exclusive to AT&T. 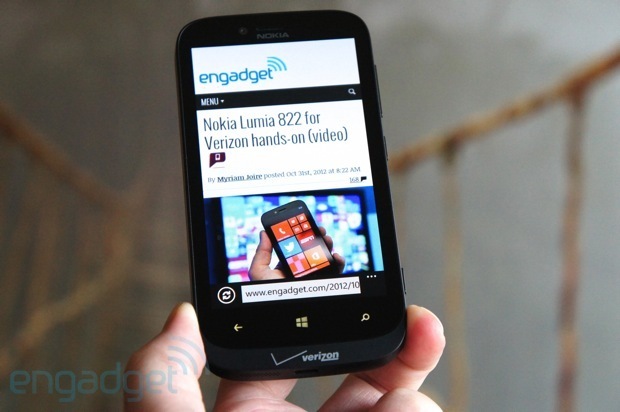 On Verizon's turf, the Lumia 822 stands as the mid-range counterpart to the high-end HTC 8X. Separating the two, the 8X features a better display, a more premium enclosure and a notification light, but it also costs twice as much. Beyond its low cost, the Lumia earns high marks for its exclusive apps from Nokia, along with its removable battery and expandable storage. All told, if price is a major factor in your purchasing decision and you're unwilling to make the jump to AT&T, the Lumia 822 is a safe bet as your next Windows Phone. If you're not completely sold on the new platform, however, the Droid RAZR M is another excellent smartphone that makes the Lumia 822 a bit tougher of a sell.